This photo was taken in Tuscany when I went there with the Ultimate Frisbee Club. 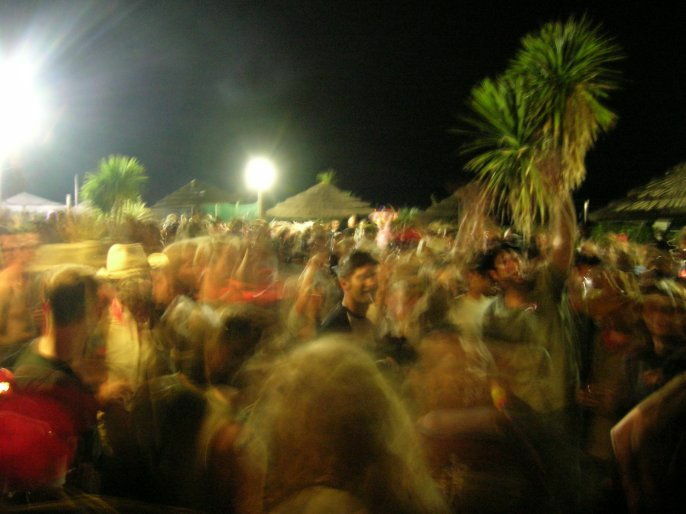 It was a beach party, and was a really great experience to be partying in the open air. I was playing around with the modes on my camera (think this was taken in "night landscape" mode). Now that one I do really like! I think you're right on the camera mode – the flash hasn't fired, and the exposure was at least a second. Looks like there was some strobe lighting too. I've used the same technique a few times in the Union. Sometimes I force the flash to fire, for a different effect (try it – if you can't force it manually, your camera might have a mode called something like "night portrait"), but when I don't, my results look very similar to yours. The pics below – hope you don't mind me me posting them in your comments box – are from the last TopB of last year. Looks great Gem, some real energy going on. Just what you'd expect from an ultimate frisbee party!